For his North American tour with Pitbull, and two years after injuring his hand at a concert in Mexico, Grammy Award-winning artist Enrique Iglesias has once again teamed up with Save the Children to launch a new #Hearts4Kids T-shirt promotion to help children affected by poverty and violence in Mexico heal emotionally. The new #Hearts4Kids T-shirt campaign builds on Enrique’s 2015 partnership with Save the Children to provide immediate relief to children after a natural disaster. The new T-shirt campaign will help children who face extremely frightening events and devastating tragedy recover emotionally and thrive for years to come. Eleven dollars ($11) from the sale of each T-shirt will go to Save the Children’s Healing and Education through the Arts or HEART program in Mexico. HEART uses the arts to help children who experience chronic stress from their life circumstances of poverty and other distressing events tell their personal, often painful, stories. Through drawing, dance, drama and other art activities, children learn how to express their feelings, such as fear, anger and grief, so they can thrive. The #Hearts4Kids T-shirt is available for purchase for $27.50 online at EnriqueIglesias.com and for $35.00 at all U.S. concert venues on his North American tour this June and September. The T-shirt will range in price at international concert venues. The new T-shirt is inspired from the original design, which was a heart drawn by Enrique Iglesias on his white T-shirt after a drone injured his hand during a concert in 2015. 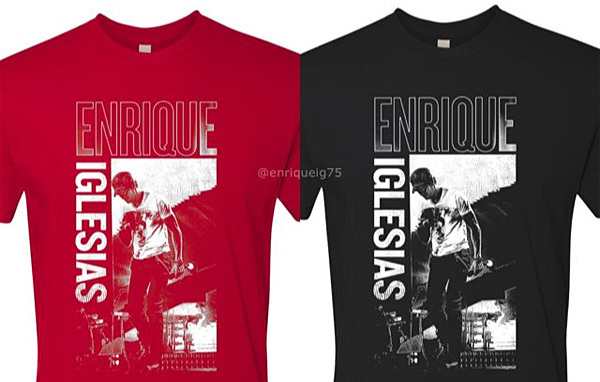 The new T-shirt is a crew neck with a photo of Enrique at that concert and is available in black or red with white lettering and image. We are grateful to Enrique Iglesias and his fans for opening their hearts to help children living in some of the toughest circumstances in Mexico," said Maria Josefina Menéndez, country director of Save the Children in Mexico. "When children bury their emotions, it can delay their development and affect their mental health. Art can provide a creative outlet of expression, especially for young children who struggle to find the words for how they feel." Added Menéndez, "We have seen a dramatic change in children once they share their stories. Their burden is lifted and they can focus on learning in school." Save the Children launched HEART in Mexico in 2016. In year one, HEART reached nearly 8,000 Mexican children affected by poverty, violence and migration in five provinces, including Baja California, Chiapas, Mexico City, Oaxaca and Puebla. The arts-based program is built into existing curriculums for children at preschools, primary schools, child and youth centers, and summer programs, as well as migration prevention programs for teenagers. HEART incorporates local arts traditions and uses locally-sourced art products. For a list of all the concert venues for Enrique’s upcoming tour, click here.